2 Master Gardeners were on site to give advise. Coffee, muffins & cookies were sold by donation. Our famous Aids Angels, painted garden stones, sun hats, fish shaped bags and Margots snap-bags + beaded bookmarks helped the total reach just over $2350. Our 2012 African Dinner was a sold out event that raised over $4,000 for the Stephen Lewis Foundation. The doors opened at 5pm and guests immediately started to enjoy the ambience, the fun of wearing a colourful head scarf and the lovely assortment of silent auction items. The African anthem N'kosi Sikilel'l announced that dinner was ready. Thirty-one hardy cyclists pedaled their way from Campbell River down Vancouver Island to Victoria on their 6th annual fundraiser. Barb Fudge of Glacier Grannies, personally raised $4025 toward the total of $65,000. All donated money will be sent to Stephen Lewis Foundation who will disperse it to African grannies via their grassroots organizations. Once again Denman Island GLADs provided a delicious gourmet food for cyclists and other grannies. The GLAD grannies did not accept money from the cyclists but told them to put it toward the fundraising total. Stay tuned for the final amount raised. 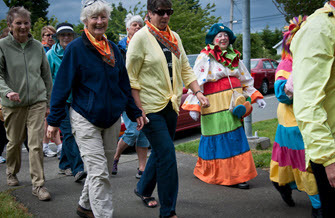 The Glacier Grannies hosted the 3rd annual National Walk for the grandmother groups in our area. Despite cold weather, a keen group of people participated in the event and $1526.10 was raised. This event was held in many communities across Canada. Thousands walked in support of African grandmothers caring for the millions of children orphaned by AIDS. The total raised from the combined Canadian granny groups is over $1,000,000 in 3 years. The mighty Merville GrandMothers, aka MGMs, hosted an evening of African singing, led by local community choir director Tina Fillippino. Everyone present was part of the choir. 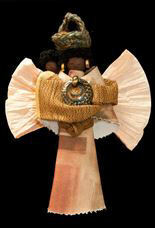 Tina led in the African tradition of call and response, a method that makes everyone feel like an accomplished singer. 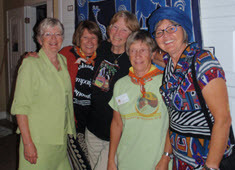 "An Evening Sing for Africa" was a fundraiser for the Stephen Lewis Foundation. 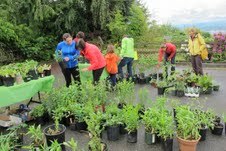 Admission was by donation; tea, coffee, baked goodies and a chance to browse the marketplace tables were available. 2 MGMs gave short talks on how the Stephen Lewis Foundation provides funding and programs in Africa. Tina ended the evening by presenting her own composition, a walking song for the upcoming "Stride to Turn the Tide" National Walk to be held 10:30 am on Sunday June 10 at Mansfield Drive entrance to Courtenay Airpark.